Stroke survivor Jill Hooper can’t wait to attend the wedding of grand-daughter Jade Glover – something that might not have been possible without her husband’s life-saving actions. Jill Hooper can’t wait to watch her granddaughter walk down the aisle – something she wouldn’t have survived to see had it not been for a ball-point pen and some speedy action by her husband. 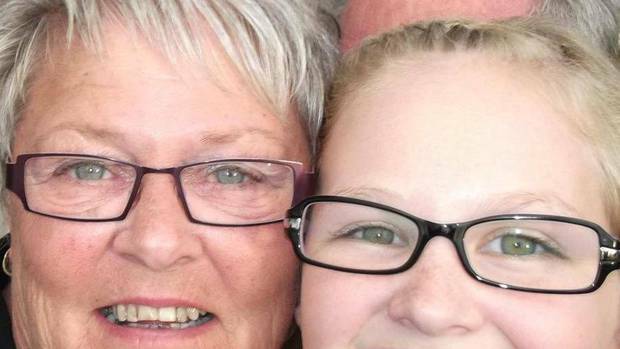 The 69-year-old from the south Taranaki town of Hawera considers herself an example of how one simple message can prove the difference between life and death when it comes to stroke risk. “I’ve been called the ‘miracle girl’, and it really was a miracle,” Hooper said of her experience on April 27. A much-loved figure in Hawera, Hooper was in her kitchen making lunch when her left arm went weak, and she couldn’t stand up. Her husband Irwin also saw her mouth was drooping on one side. 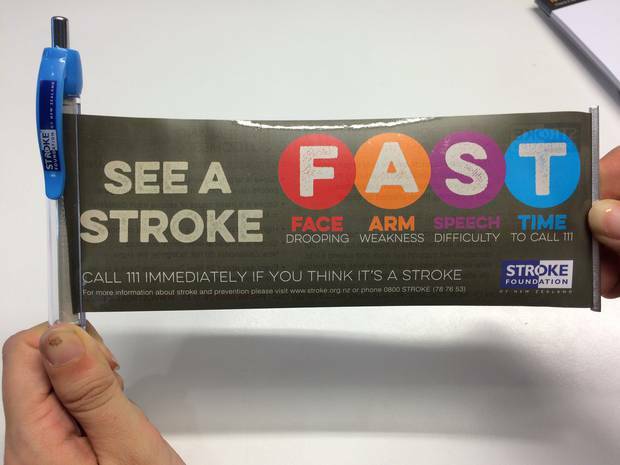 Irwin immediately realised it was a stroke because the couple had a Stroke Foundation pen which contained the FAST message – Face drooping, Arm weakness, Speech difficulty, Time to call 111. So he did just that – he called an ambulance and his wife was quickly taken to Taranaki Base Hospital, where she was given clot-dissolving medication before being flown to Auckland Hospital. “My family was told to say goodbye just in case – but they refused to say goodbye,” she said. One of the family members at Hooper’s bedside was granddaughter Jade Glover, who’d just got engaged to partner Shane. “I said to her, ‘You can’t die on us, Nana, you’ve got a wedding to go to’,” Jade said. “At first the specialists thought the left hemisphere of her brain might have died. While Hooper was unconscious, Glover’s brother played her some of her favourite music, and Hooper started moving her arms and legs. Incredibly, the next day Hooper was sitting up in bed and talking. She spent a week in hospital, and now considers herself back to normal. But just as crucial was the couple knowing FAST – and hospital treatment was only effective because her husband had been so quick. “We had the pen, and we’d seen the TV ads, so I knew what to do,” he said. Hooper said she’d had blood pressure problems, but it was an irregular heartbeat that caused the stroke, and she was now taking blood-thinning medication. Stroke Foundation chief executive Mark Vivian said knowing what to do in a stroke was the best way to help a family member recover. This ballpoint pen, and the message on it, helped save Jill Hooper’s life. In New Zealand, it’s been estimated up to 9,000 people have a stroke each year, and 50,000 people live with the consequences. The FAST message is the focus of an annual campaign launched today by the foundation, the Ministry of Health, and Health Promotion Agency. In a twist on the traditional acronym, the campaign is promoting the T in FAST as “Take action” – a reminder that calling 111 immediately is essential. “Luckily Irwin took action and helped save Jill,” Vivian said. Before last year’s FAST campaign, St John was attending about 160 suspected stroke incidents every week. During the campaign, the average rose to 196 incidents per week – an increase of 22 per cent – peaking at 231 incidents in one week. “We’ve heard from people who saw the FAST message, never expecting to use it – then found it helped them save someone after a stroke,” Vivian said. The campaign follows recent research by the University of Otago predicting a sharp rise in stroke cases over the next decade, unless better prevention measures are put in place. If further reductions in stroke incidence couldn’t be achieved, the number of sufferers could rise from 7231 in 2015 to 10,112 in 2028.